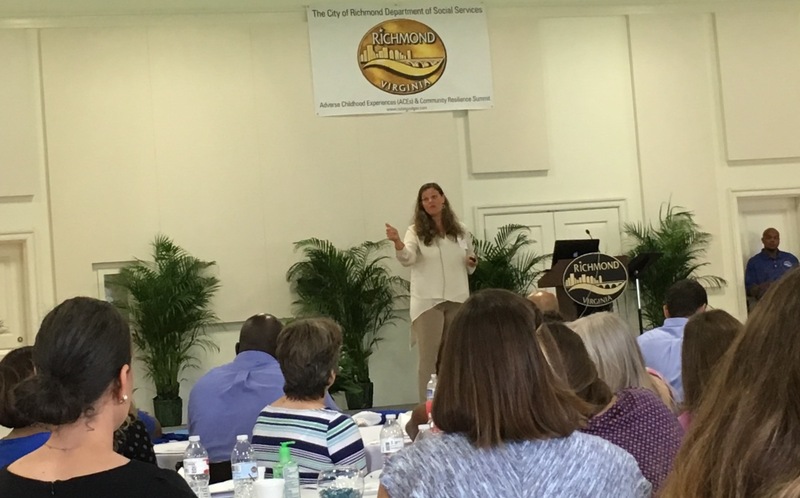 Last week the city of Richmond hosted the first local Adverse Childhood Experiences (ACEs) & Community Resilience Summit. The two-day conference attracted over 200 participants and brought many diverse voices, from youth to policymakers, to one table to discuss trauma-informed care (TIC). Through these discussions, Richmond city officials demonstrated a fervent commitment towards implementing trauma-informed practices into its systems of care and towards working with localities across the state to build a stronger trauma-informed network. Throughout the conference, there was a strong push to incorporate more youth and families/caregivers into the conversation about trauma. After hearing multiple presentations, it became clear that our state’s systems cannot become truly trauma-informed without 1) teaching youth and families about trauma and how to successfully navigate trauma-informed systems and 2) listening to these respective groups in order to understand where their needs and concerns lie. In addition, presentations from David Wallace, Dr. Robin Foster, and others demonstrated that trauma can be presented differently in different environments at different times; therefore, it is important for all individuals interacting and working with those with trauma (from a front desk employee to a policy leader) have a baseline understanding of the way ACEs impact the brain and the body. Further, messages from the Summit reminded us that it is important for individuals working with trauma to remain transparent about their own ACEs and to share their areas of expertise with their fellow advocates. Being transparent about personal experiences with trauma and personal triggers allows those working with trauma victims to do so in a more effective manner. Similarly, trauma-informed work is more effective when those working with ACEs make the conscious effort to share information about the knowledge they have learned and the projects they are working. Communication is crucial because it prevents duplicate trauma initiatives from happening and ensures that different sectors are working in unison. To stay up to date with networks formed from the Summit, follow the #ResilientRVA hashtag on social media, look from more presentations posted soon at rvaacesummit.net and stay connected with the upcoming RVA page on: http://www.acesconnection.com. Lastly, the Summit demonstrated that, beyond tangible tools like handouts and a toolkit, personal stories are extremely impactful tools. Many presenters, like Chauncey Strong and Dr. Allison Jackson, showed that these types of touching stories help to create a clear and relatable understanding of trauma and can be utilized to spread awareness and gain support for improved trauma-informed care in any level of work—from the organizational to the policy level. Beyond these lessons, our team at Voices was also able to obtain a better understanding of some of the barriers and solutions to implementing trauma-informed care in our state. During the Summit’s discussion portion, some common barriers that were identified by participants were: funding issues, a strong focus on local endeavors, legislative barriers, and a lack of resources for youth. For instance, in VA there is a lack of funding for trauma work due to: a misunderstanding of toxic stress, competing priorities for funding, an unequal distribution of funds for preventive services, fear of inputting resources into innovative practices, and a lack of buy-in from funders. Further, in our state much of the trauma-informed focus is centralized only in the capital (Richmond) and our localities have a very strong level of influence—therefore, it is difficult to implement statewide trauma-informed practices. Other barriers to implementing TIC throughout the state include a frequent turn around of power at the legislative level, a lack of communication between sectors working on TIC, a lack of youth peer support, and poor health resources in schools. So, with all of these barriers—what next steps can we take as a state to improve trauma-informed practices and policies in Virginia? An impactful first step would be to establish a common language around toxic stress. Due to the various definitions of trauma that exist currently, it is often hard to gain substantial support for trauma-informed practices and policies because it can seem as if “everything is trauma” or that traumatic experiences do not require formal intervention. Making strides to get a legislative resolution (like this one) that establishes a clear, consistent definition of trauma will help garner legislative support and establish change at the state level. Another influential step would be to establish a state-level infrastructure that helps to establish and coordinate a collaborative effort towards trauma-informed practices across the state. This would help to foster communication between different sectors and ensure that we are working towards the same goal. A third strategy to compliment these efforts could be to reach out to policy makers, educate them on trauma and resilience, and then incorporate them into the process of creating trauma-informed strategies. For info on how to reach out to legislators, see the Voices Legislative Advocacy Guide! Lastly, building up networks of professionals and agencies, like the Richmond Trauma Informed Community Network, across the state would allow for greater opportunities for cross-sector planning and sharing of ideas, and a way to organize various trauma-informed efforts and events. To see some of the work this group is doing, check out some of their reports here. Together we will continue to build a more resilient state that will support our youth!